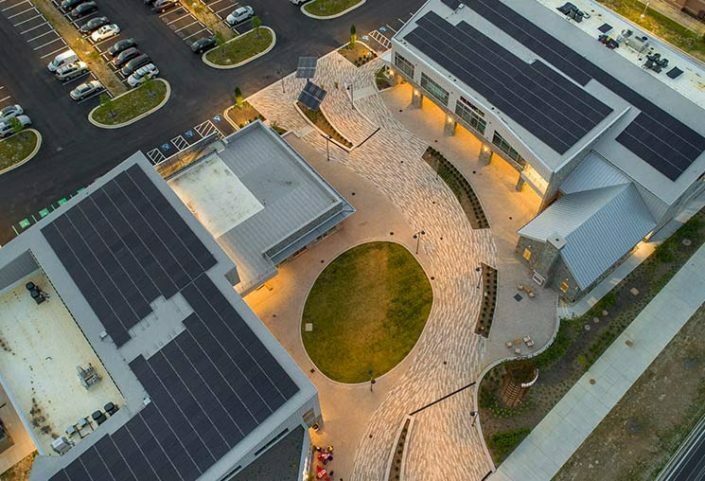 Clarksville Commons celebrates environmental sustainability in ways the community can see and appreciate – from solar power and a green roof to water collection and reuse. Our shops, restaurants and offices are also committed to adhering to our exacting guidelines for recycling, energy and water use. Scroll through some of our sustainability features. Our green roof is quietly working hard. 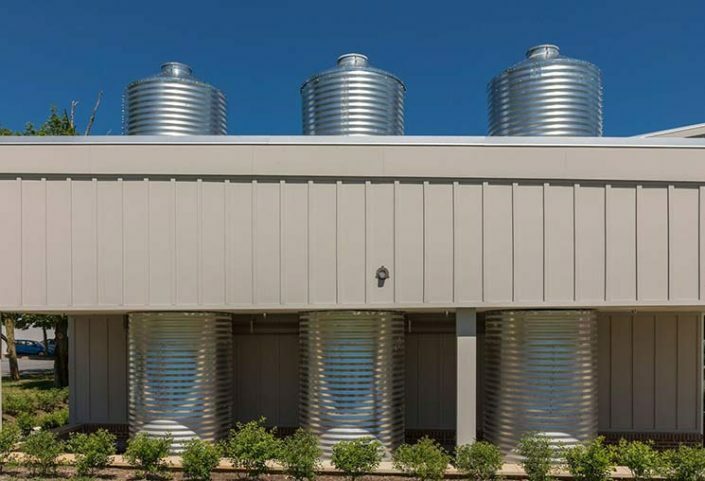 It absorbs rainfall, decreases storm water runoff, and significantly improves air quality. Extends the life of a roof by 2-3 times. 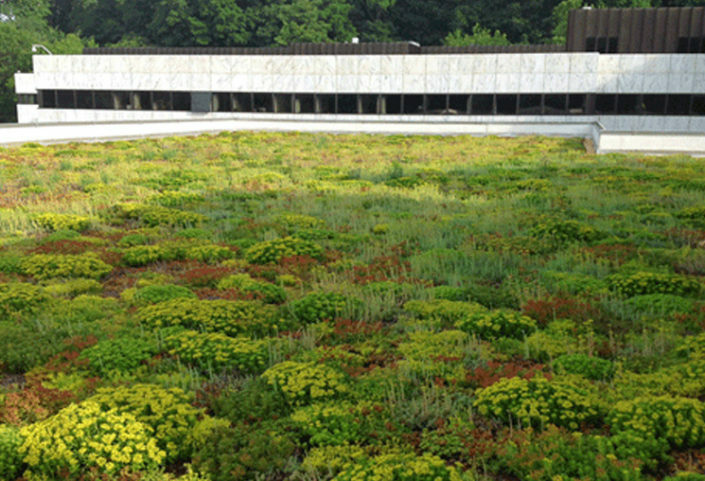 Some green roofs can last 50 years! Saves energy by insulating the building, which can prolong the useful life of HVAC units and cut carbon dioxide emissions. The largest use of energy in buildings is used for cooling and heating! Plants improve air quality by capturing airborne pollutants. 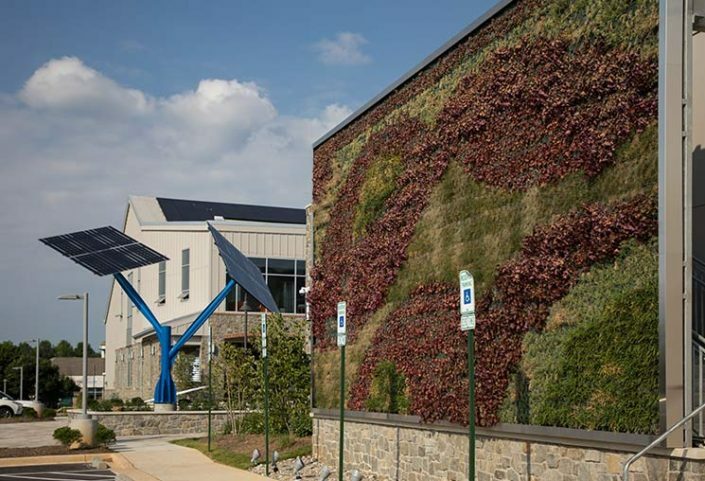 Look up at the south-facing roofs and you will see our collection of solar photovoltaics. We have 585 solar panels, each generating 280 watts. Altogether they generate 187,960 kw/hr per year. That’s enough to power a typical house for a month! Here at the Commons that’s enough to power ALL of the outside lights and interior common areas. Any extra power produced by the panels is banked with the electric company and credited to the Commons. Click here for a short video that explain how it works. A great way to slow the flow of rainwater. 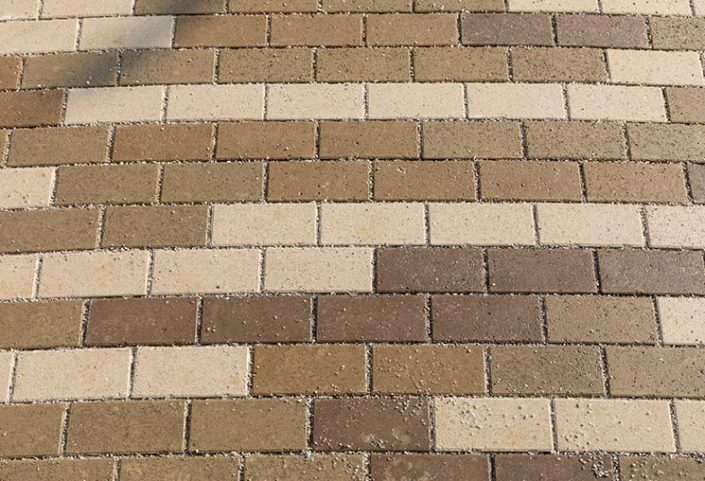 The special pavers in the courtyard allow storm water to filter back into the ground instead of running off. This reduces erosion and flooding, keeps nearby streams clean, and ultimately is good for the health of the Chesapeake Bay. 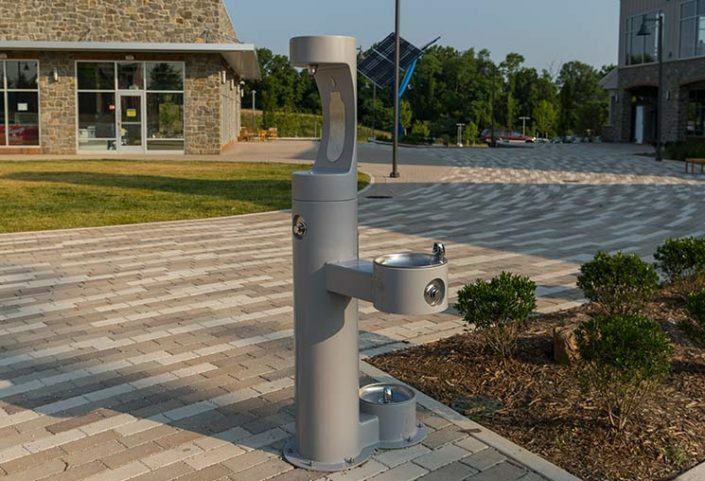 Stay hydrated… and don’t miss our dog fountain! Reuse your water bottle. 38 billion plastic bottles end up in U.S. landfills each year. Tap water can cost 500 times less than bottled water. Production of disposable plastic bottles releases toxins into the air and requires more water than goes into the bottle. 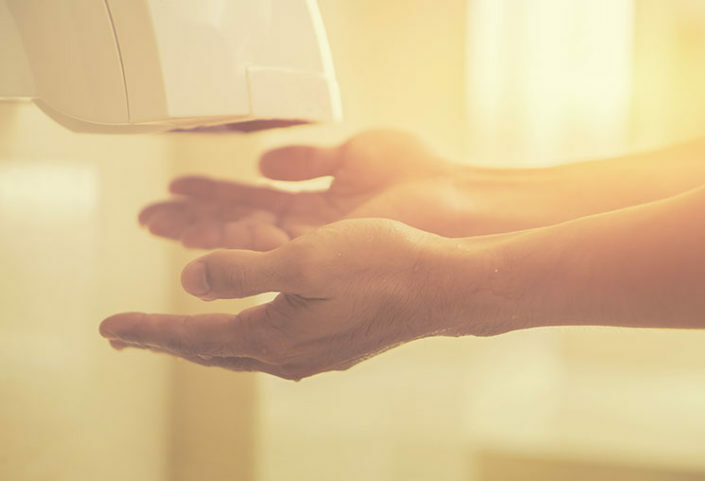 Energy efficient electric hand dryers use less energy and natural resources than paper towels. To produce one ton of paper towels consumes 17 trees and pollutes 20,000 gallons of water. And then there’s all the energy required and pollution created to cut down trees, take them to the mill, and turn the trees into paper towels. Once you’re done with the paper towels, they will take up space the size of a compact car in the landfill. Hand dryers generate no waste, thereby reducing what goes to the landfill. Swales are the rectangular grassy areas between the sections of our parking lot. They are designed to capture the rain that flows off the pavement. During heavy downpours, water is slowed, minimizing the risk of flooding. Swales increase water infiltration, filter pollution, and increase ground water. Less rainwater runoff means a cleaner and healthier Chesapeake Bay. Click here to watch the Chesapeake Bay video on runoff & NASA’s role in monitoring. Absorb carbon dioxide, a greenhouse gas, and filter other air pollutants. Release water (evapotranspiration), which cools the surrounding air and buildings. Save water and save on the water bill. 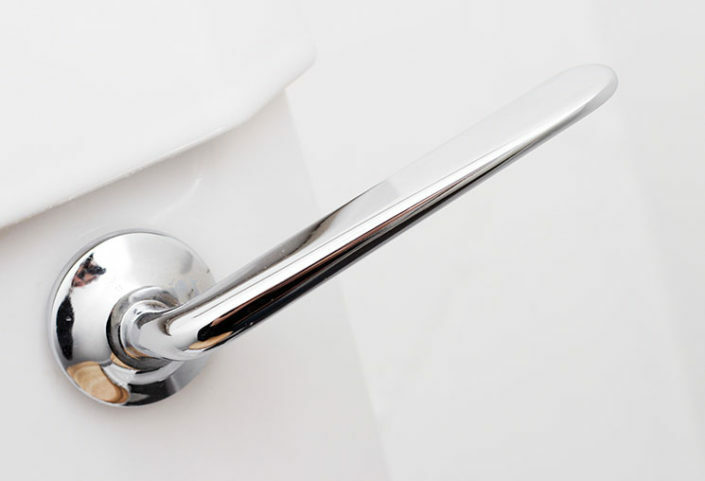 Residential dual flush toilets can save a family about 4,000 gallons of water per year. Less than 1% of the Earth’s water is fresh and our population is growing rapidly, so please conserve water whenever you can. Click here for the EPA website where you can learn some other water saving practices. 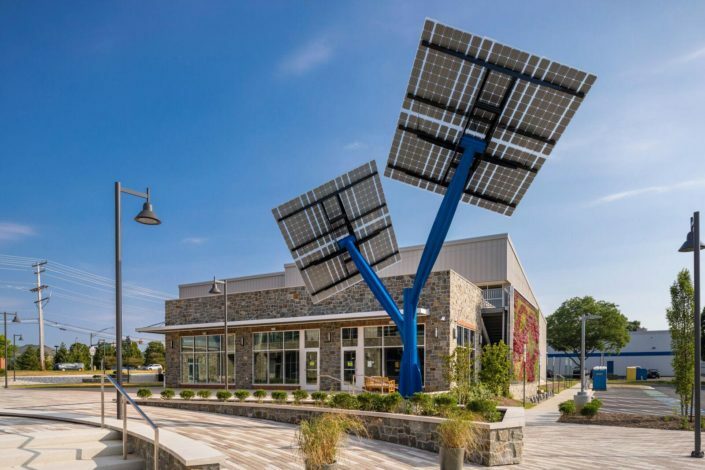 Our beautiful solar tree produces 3 kilowatts! What could you do with 3 kilowatts? Run eight 100 watt light bulbs for 1 hour or eight equivalent LED light bulbs (13.5 watts) for 27 hours. Operate your 42” LCD TV (160 W) for over 18 hours. Run your laptop computer for almost 67,000 hours. Do a load of dishes using the heated drying cycle for 2.1 hours (1200 watts for the dry cycle + 200 for the dishwashing.) Or turn off the heated dry and run it for 15 hours. Run the microwave for 2 hours or bake for 1.5 hours. Use your blow dryer for 3 hours. Click here to learn more ways to get the most for each kilowatt you use. Enjoy the beauty of our rain garden. Rain gardens are one way to decrease water runoff, increase water infiltration, and hold the soil in place during rainstorms. Our native plants were chosen to provide a progression of constant color throughout the year. Native plants supply pollinators and other wildlife with a wide variety of food . 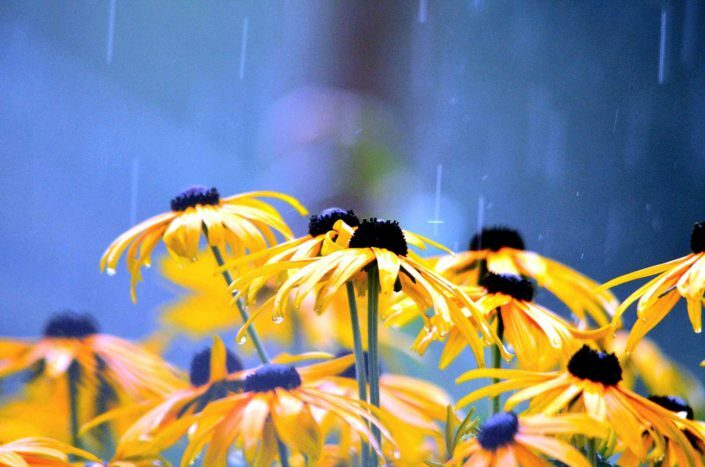 Our plants thrive on Maryland’s typical amounts of rainfall, so they rarely need watering. Click here to learn how to construct a rain garden of your own on the Howard County Website. 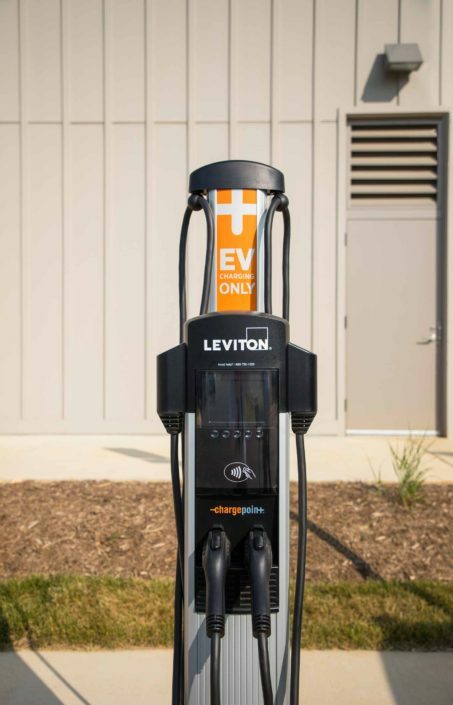 Charge your electric vehicle for free while you’re at the Commons! EVs average $3.48 to go 100 miles. It’s like driving a gas-powered car that gets 71mpg. EVs generate no tail pipe emissions. From production to disposal, the lifetime carbon dioxide emissions of EVs are much lower, even if the electricity is produced by 100% coal. Over their lifetime, electric vehicles cost less to own than gasoline-powered cars. Maintenance costs are lower for EVs since there are no oil changes and fewer moving parts involved. There are no tail pipe emissions with an electric vehicle. From production to disposal, the lifetime carbon dioxide emissions of EVs are much lower, even if the electricity is produced by 100% coal. EV’s convert about 60% of the electric energy into acceleration, whereas gasoline engines only convert about 19% of the energy stored in gasoline into moving the car. 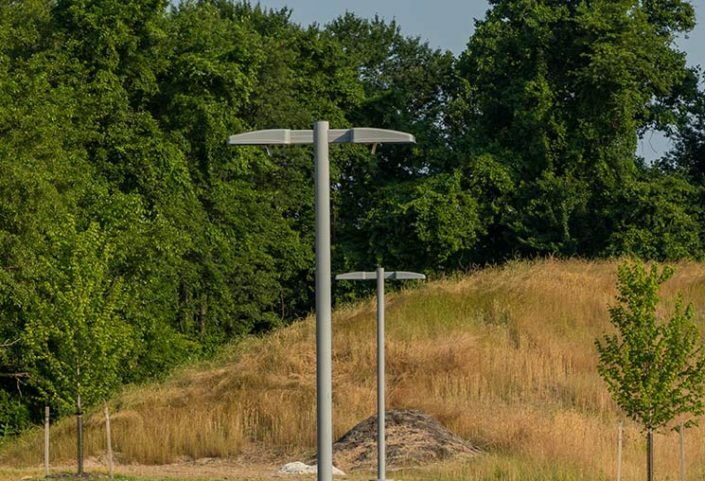 Many more EV charging stations are being built; there are over 500,000 EV’s already on the road. Click here to learn more about Electric Vehicles. International dark-sky association (IDA) lighting is short but powerful. Artificial lights affect wildlife and ecosystems. One example is hatching sea turtles heading toward the glimmer of lights instead of the moon reflecting on the ocean. 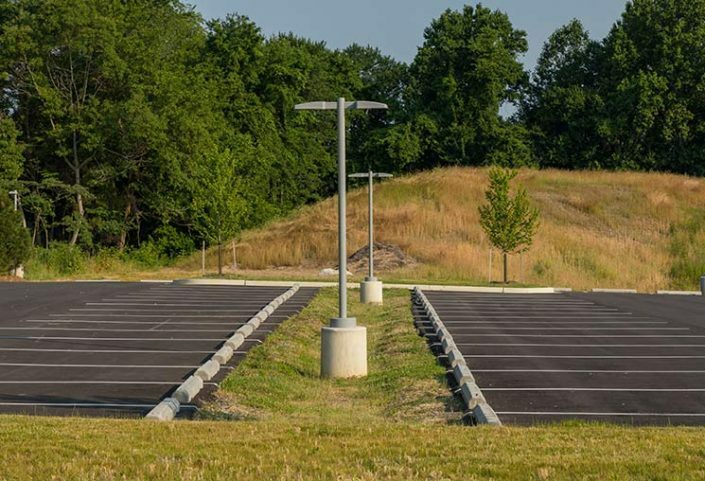 IDA lighting is shielded to only cast light downward, protecting wildlife from dangerous misinformation. Artificial light diminishes the view of the starry sky. When’s the last time you saw the Milky Way? IDA standards minimize light pollution, allowing us a better view of the starry sky. Over-lighting developed areas at night is an unnecessary waste of energy. There are six cisterns at the Commons, each of which can collect and store up to 1,000 gallons of water. Recycling storm water for irrigation reduces the amount of city water that we use on our plantings. Using the stored water will save many gallons of water every year.